It Cosmetics is easily one of my most reached for brands- check out my holy grail It Cosmetics Cream highlighter review here! I have some new products to share today & went ahead & created a full look. 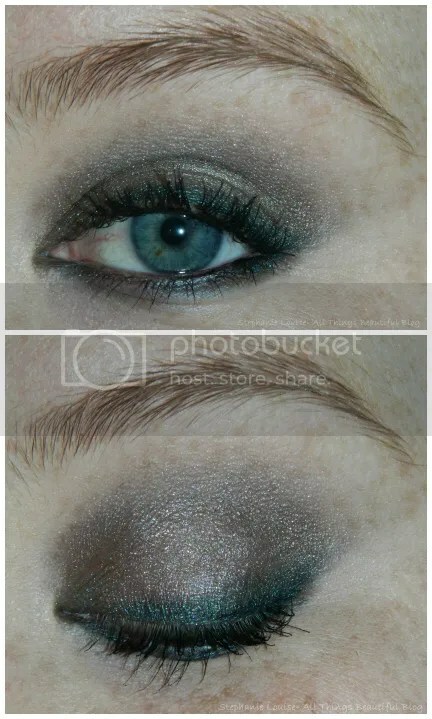 I also have a tutorial on this eyeshadow look which you can view here! Keep reading to learn more about the It Cosmetics CC+ Cream, Brow Power, No-Tug Waterproof Gel Eyeliner, & Vitality Lip Flush Butter Gloss in Naturally Pretty. The packaging on all 4 of these products is just so It Cosmetics- silver/grey based & classic. 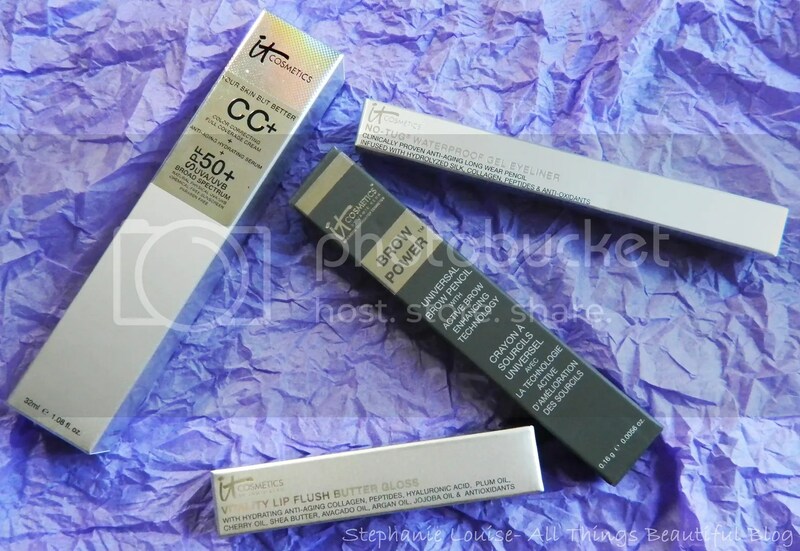 Nothing excess or over the top but extremely informative all the way around the boxes.The It Cosmetics Your Skin But Better CC+ Cream actually has a touch of holo on the front which is way cool. The packaging on It Cosmetics is always awesome, I’ve never had a dud, issue, or even something I’d change. They put a lot of thought into design both for aesthetics & actual use of the products. 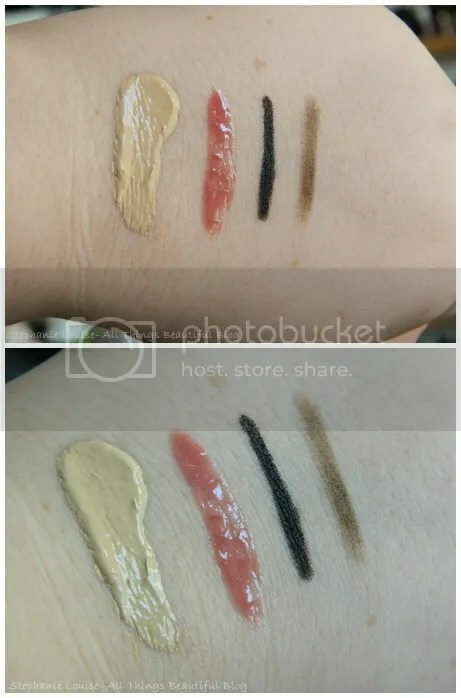 Swatches left to right: It Cosmetics CC+ Cream in Fair, Vitality Lip Flush Butter Gloss in Naturally Pretty, No-Tug Waterproof Gel Eyeliner in Black, & Brow Power Universal Brow Pencil. 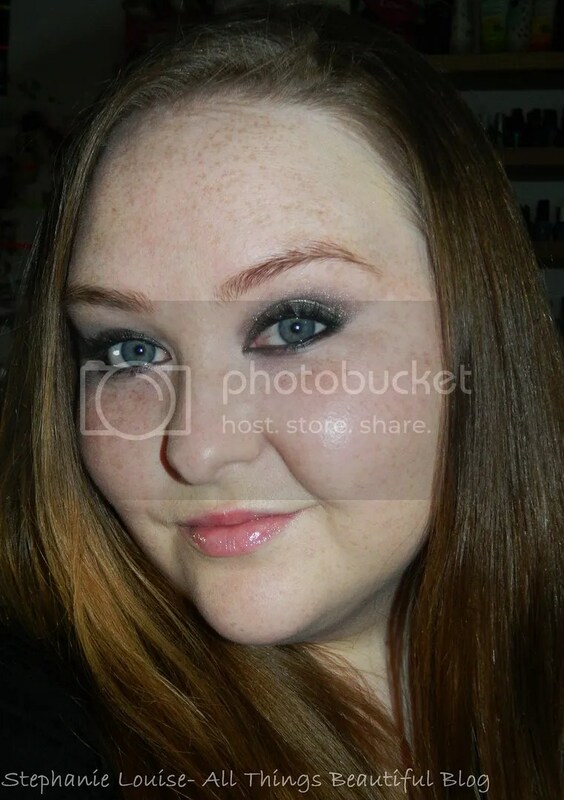 On my eyes I have the It Cosmetics No-Tug Waterproof Gel Eyeliner in black on both my tightline, halfway on my waterline, & as a base on my lid to make the shadow adhere as eyeliner. This eyeliner is VERY black which I absolutely love! It glides on absolutely effortlesly & you have time to smudge it if you wish to do so. This pencil is infused with hydrolyzed silk, collagen, peptides, & anti-oxidants. Although this makes it sound like something I’d eat as opposed to something I’d wear it must really work because it looks & feels so smooth & not dehydrating in person. I really hope they come out with something similar in jumbo pencil form! Both paraben & fragrance free this is excellent for my allergy eyes & it honestly didn’t budge except in my waterline which is normal. It wasn’t nearly as bad as other liners though which is amazing because usually the ones that stay put are much more hard/waxy. They actually have quite a few shades, I have my eye on Plum & Copper next! On my brows all I have is the It Cosmetics Brow Power Universal Brow Pencil. I’m quite judgmental of brow pencils since day to day I actually use brow powder & setting gel. Too many pencils lean a strange shade on my light cool toned brows like red, honey, or go way too dark. 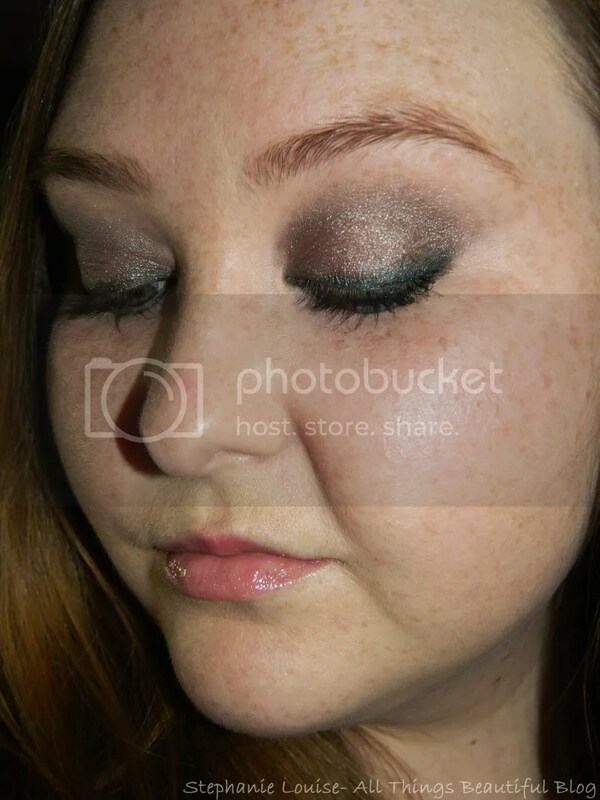 This is ore of a taupe, something I look for on my brows. I’m admittedly picky but was surprised when this really worked for me. I went with a less defined brow, something more natural, since that is always really hard for me to do with pencils. I find it is extremely easy to go overboard & look “drawn on” as opposed to naturally full. I love this pencil. The shape of the tip is more of an oval & the product itself is stiff so you don’t get harsh lines. I can barely tell I’m wearing it which I consider a total success in the natural department. You also get a built in (& covered for us OCD types) brow spooly on the other end which makes this a very quick & easy tool. I had absolutely no smudging & this pencil states it is also waterproof which I’ll be putting to the test this summer! I can’t believe I’m raving about a brow pencil, seriously. On my lips I have the It Cosmetics Vitality Lip Flush Butter Gloss in Naturally Pretty…which is a very naturally pretty shade. I’ve actually reviewed two other shades from this line so you can check out more detailed photos here. There you can see a nice view of the applicator which I love- it kind of has a well that applies product perfectly.This shade is so natural that it is almost like a MBBG- My Lips But Better Gloss. So pretty & oober comfortable even though it has a bit of shimmer. I recommend these constantly because the formula is fab. 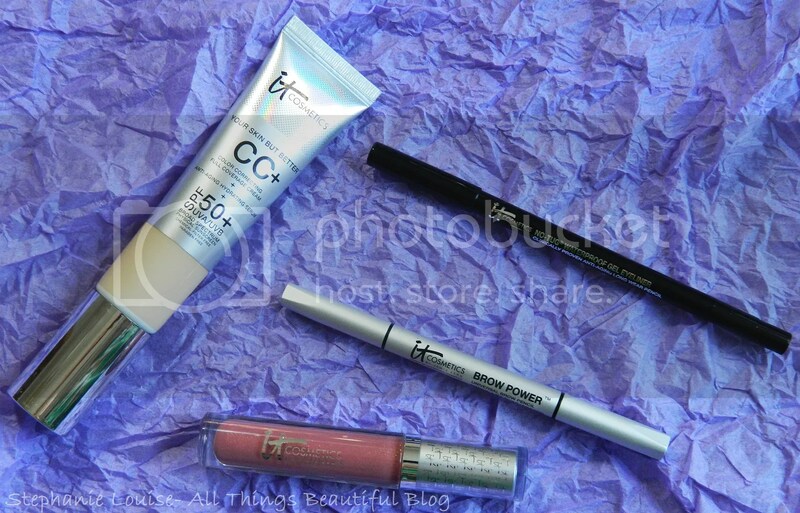 The product I was most excited to try: the It Cosmetics Your Skin But Better CC+ Cream! I have heard nothing but absolutely amazing things about this product so I’ve been practically jumping to try it. The claims are absolutely the highlight for me: Color Correcting Full Coverage Cream, Anti-Aging Hydrating Serum, & SPF 50+ UVA/UVB Natural Physical Chemical-Free Sunscreen. I mean…seriously is this the fountain of dreams or what? I’m SO fair & find that BB/CC shades are hard to match for me personally but the lightest shade Fair seemed to blend right in although it is yellow toned which helped correct redness on me!This also has a pump which is amazing, always a big plus for me personally. The finish on this is amazing, it looks really natural & maybe a bit satin. The coverage is amazing! The only concealer I put on is under my eyes & on the cut above my eyebrow. The first photo above is my bare skin- you can see I have lots of freckles, some redness, & I don’t look oily because I’m pretty dry. The bottom photo is right after application & my redness is gone! I applied with my hands but then blended out with a brush because I found the finish to be nicer. It is a thick cream so I think a brush just does a better job. I do think it looks a bit yellow right after application but it blended into my skin & looked much better within 10 minutes. The wear time was amazing as well, much better than some of my traditional BB creams that often begin to fade later in the day. I feel like this covered my skin imperfections without looking like a mask. Very natural & easy to wear. I can see myself wearing this a lot during the day because I might want fuller coverage through the night. I can definitely see this going from day to night easily though, especially during the spring & summer when I am outside & need an excellent sunscreen. I have been reaching for this a ton during the winter too since my skin is drier & I still need sunscreen. You still need sunscreen too FYI, not just me. I don’t have issues with this sticking to dry patches or getting blotchy, a miracle for my dry skin. For my face I also used the It Cosmetics Heavenly Luxe Pointed Precision Luminizer Brush & It Cosmetics Hello Light Anti-Aging Radiance Creme which I reviewed here. I still cannot stress enough the difference this amazing cream highlighter has made for my dry skin, nothing comes close. When I wear a BB/CC cream alone (as I’m doing here) I like to use creme products for my highlight/blush/bronzer. I have dry skin so I usually don’t even set my makeup. 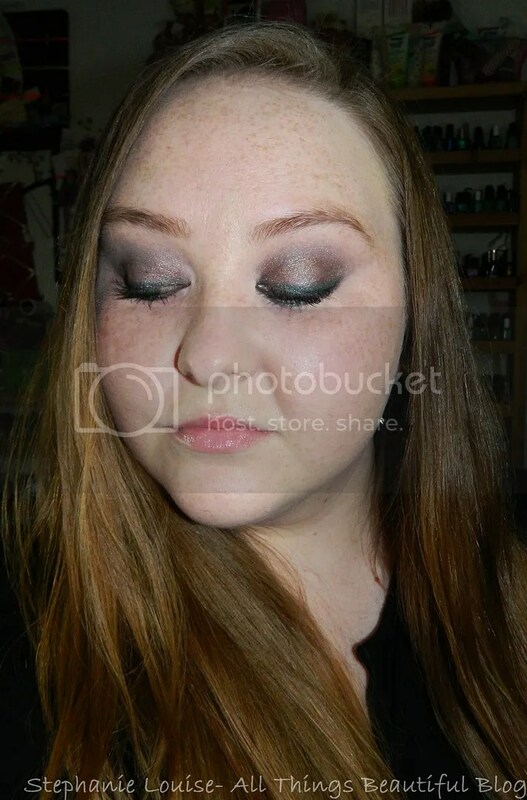 Again, you can see my eyeshadow tutorial in this post here. Overall, I have 4 hits here which is wild! I think the eyeliner is easily something I’ll use daily & the Brow Power when I want to do my brows quickly. The Naturally Pretty Vitality Lip Flush Butter Gloss is just gorgeous, so lovely. I cannot stress enough how much I love this CC Cream- the finish is natural, amazing color match, & it really is full coverage without looking unnatural! I’m pretty much blown away- I can’t believe how happy I am! I usually purchase my It Cosmetics products from ULTA but they are also available on the It Cosmetics website here & QVC which sometimes does deals! There is a gorgeous lipstick & another brush set that QVC has for holiday this year that I’d LOVE to get my hands on! I also really want the new It Cosmetics eyeshadow palette that is completely matte with a shimmer transformer! Gorgeous! I’ve done quite a few It Cosmetics reviews, you can type that in my search bar to pull up other reviews! Have you tried any of the products mentioned? What are your favorite It Cosmetics products?